Getting a message from Sylvester Stallone about a Bollywood Rambo remake was like "an endorsement from God", the film's director has said. Sid Anand told fans there would be none of the singing and dancing often associated with Bollywood however. "I wouldn't do that to Rambo," he told the BBC. "That's like blasphemy." The movie is being launched at the Cannes Film Festival - though filming doesn't start until later this year. Indian star Tiger Shroff is taking on the titular role. On his decision to launch the project in Cannes, Anand said: "Rambo is a global icon. He resonates in every part of the world, so it's important to start our campaign at the Mecca of film-making." He said he was driven to remake the movie because of the strength of the character of the "true blue action hero with a heart", immortalised by Stallone. Anand said he had a script which will "resonate in India" - but warned: "It could be controversial like Rambo First Blood was in the 80s. "It makes you think, and is about a situation that's prevailing in India and is unique in that way." Stallone had posted a message on social media last week, saying Rambo was a "great character", adding: "Hope they don't wreck it." But he later sent a message to Shroff himself, wishing him the best of luck. "He has been kind enough to Tweet about it. It's like an endorsement from God himself," said Anand. Asked what fans of the original will think, he said: "I'm aware there will be polarised reaction from the fans of Rambo who don't want it messed with. I have to make it worthy of the legacy of what Rambo means. "Those kinds of films aren't really made any more. So that made me excited to bring it to a young generation." Shroff, 27, said he thought the project was "too good to be true" when he was first approached about it. He said: "In my eyes, Sylvester Stallone will always be Rambo. He's my hero. "I don't want to replace him, but to give a different take on it. They are huge shoes to fill." 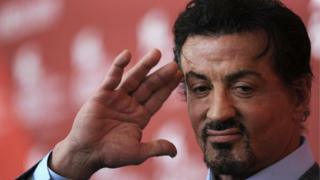 Shroff told the BBC it was "heart-warming" to receive social media messages from Stallone. Shooting on the film - due for release in 2018 - starts in the Himalayas at the end of the year.